Adam Johnson, Demba Ba, Manchester City F.C., Mario Balotelli, Nigel de Jong, Pablo Zabaleta, Premier League, West Ham United F.C. The two teams came into this match in different circumstances. West Ham came into this game dead last with 32 points, while City was holding on to fourth place with their expensively assembled team. West ham set up in a 4-4-2 formation and would later switch to a 4-5-1 formation following the two goals. The Hammers defense unit would drop back deep into their half before applying pressure. At times no to minimal pressure was applied on City’s attacking players. They defended always defended with 9 players. When they were using the 4-4-2 they defended in 2 banks of 4 with one of the strikers dropping back in front of the midfield. In the 4-5-1 their midfield 5 helped cover their back line. 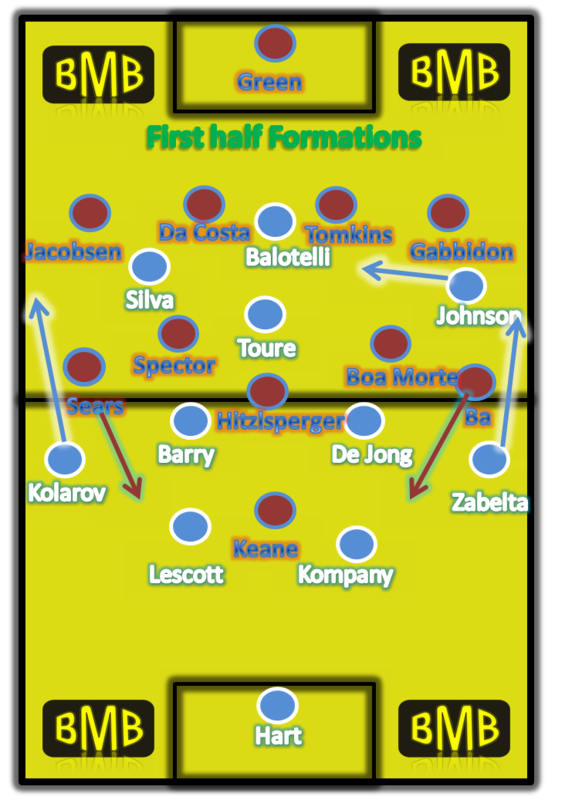 Man City played their usual 4-2-3-1 which had Silva in an already central left position operating as an attacking midfielder. His counterpart Johnson started out in wide position only to move central when he got the ball. City got their fullbacks into attacking position to provide for the width lost by Silva and Johnson. 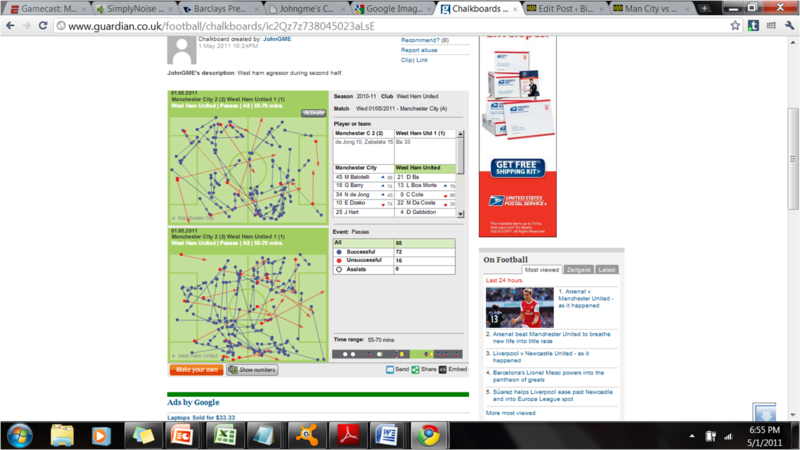 De Jong was the deepest of the midfielders and stayed close to the back two. To provide extra protection for the city defense as their fullbacks pushed forward. 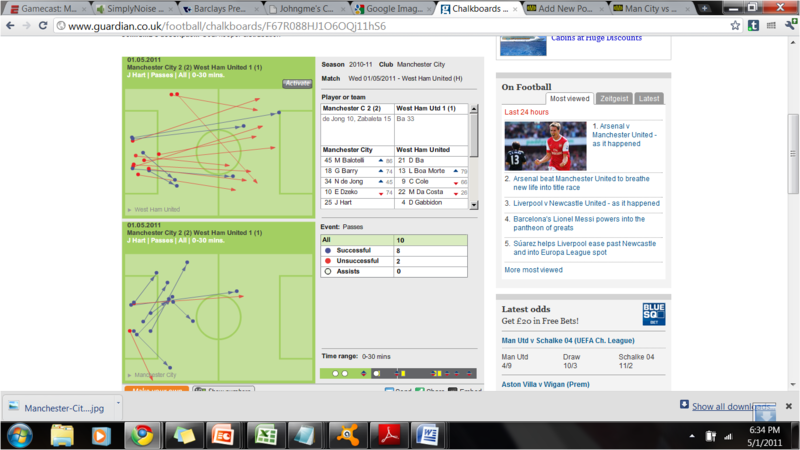 Balotelli led the line and looked to run onto the occasional City long ball. Manchester City dominated the first 30 minutes of the half. They had 10 shots and two goals. West ham had 1 shot and no goals within that period. 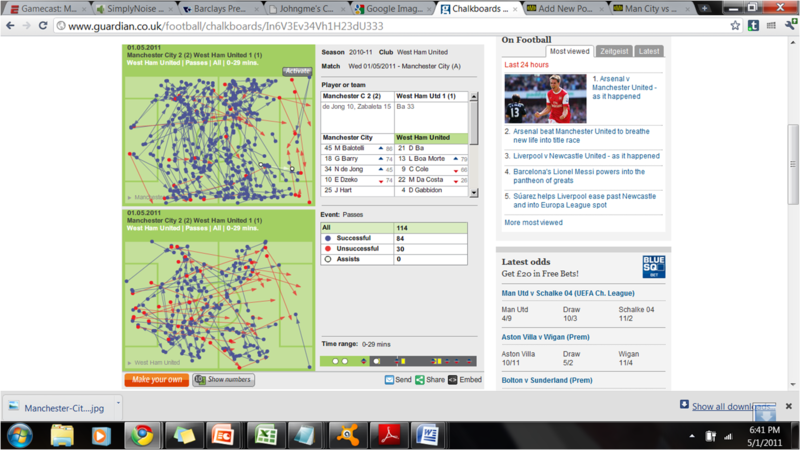 Man City dominated proceeding to the point where by the 27th minute they had 58% possession to West Ham’s 44%. West ham inability to retain the ball and build up play was caused by Robert greens distribution within this period. The majority of his goal kick’s were sent long and were intercepted by the Man City defense .His long goal kicks allowed City to regain possession and attack. By the 30 minute he completed a third of his goal kicks and ended the match with only 12 successful goal kicks out of 35. Joe hart on the other hand hit the majority of his goal kicks short and completed the majority of them 8 out of 10 by the 30 minute. 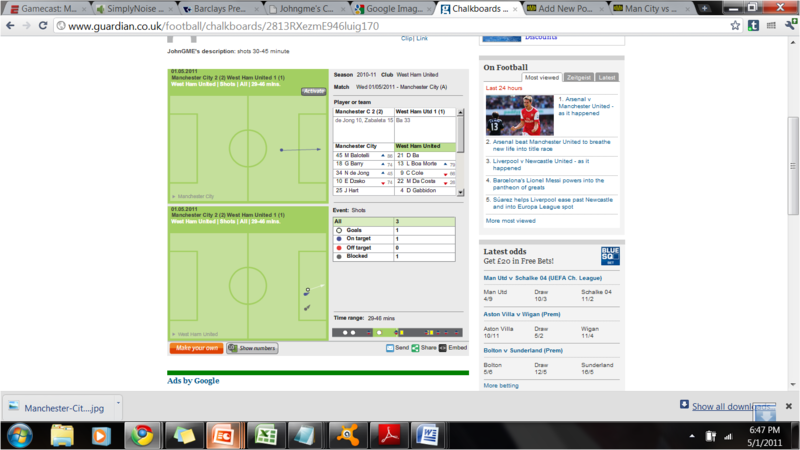 West hams pressing or lack of it contributed to City’s dominance in the first 30 minute. West ham would set their defensive line midway in their half and then continually drop back as Man City passed. There was a lack of cohesive pressing which made it easy for City to pass through them. Lastly West ham passed poorly. They couldn’t string a series of passes together, a lot of their incisive balls were misplaced and or intercepted, and they sent long balls which would later be intercepted. They played 115 passes with above a 1/4th (31) of them being intercepted. Man City played double the amount of passes 208 and had less passes intercepted (27) showing the difference in passing between both teams. With West Ham unable to keep the ball and build up attacks; City was left to dominate proceedings for the first 30 minutes. The first goal was a result of poor defending. Hitzelberger didn’t clear the ball well and it ended up at the feet off De Jong to score the goal. The second goal was a due to the lack of pressure placed on Silva. He was allowed time and space to pick out Zabeleta who got forward and threaten to get in behind the West Ham defense many times in the first half. His influence would die out in the second half. The first half isn’t 30 minutes long though and West Ham improved as they searched for goals.They moved to a 4-5-1 and started to build their first real attacks and started to expose Man City’s defense. West Ham sliced city open for the first time and Keane went 1v1 with hart. They had 3 shots from 31-33 minutes one of which resulted in a poorly defended goal. Man City had 1 shot past the 30 minute mark from Adam Johnson. West ham’s possession improved from 44% to 50-50 by the 44th minute. With the inception of the second half West Ham became the aggressors. By the 70th minute West Ham dominated the possession category with 55% possession. 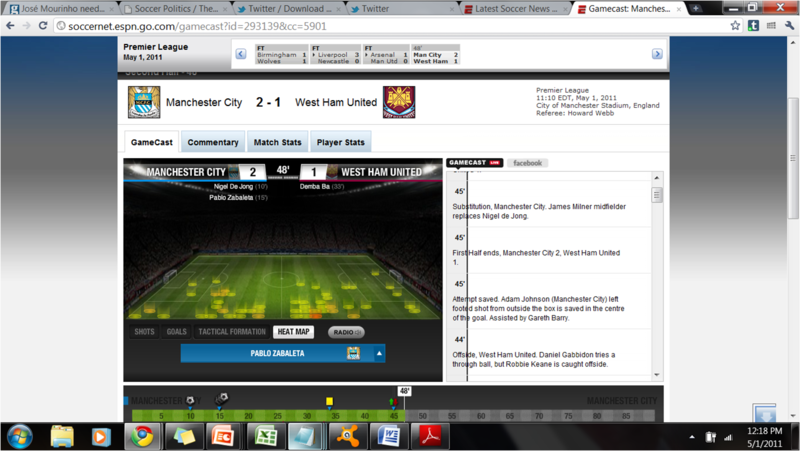 This was a result of the pressure applied by West Ham on City to try to equalize. They stuck with their 4-3-3; when attacking they kept 3 at the back with Jacobsen pushing forward. They used a higher defensive line as they looked to pin city in their half and attack more. Although this left them vulnerable a few times to the through ball from midfield or to the City counter attack. By the 60th minute City were leading the foul count 7 to 5 showing how the extent to which West ham were attacking them early in the second half. During this prosperous period for West ham they took 3 shots all in the box while city took two both coming from Boaltelli. From the 55th minute to the 70th West ham had attempted 88 passes and completed 72 Whilst City attempted 65 to complete 53; illustrating West Ham’s edge over City during this period. Changes were made following this improved period from West Ham. Barry was taken off and Dzeko (75th minute) was introduced. Man city seemed rejuvenated and attacked better after this substitution. 5 shots out of 9 second half shots were taken following Dzeko’s arrival two of them was taken by yours truly. Dzeko himself didn’t make the turn around. It was most likely the changes that stemmed from Dzeko’s introduction. Yaya Toure moving into midfield, Boaltelli was moved into a more advance left inside role, and Silva who played a big role in City’s improved performance was moved into a central play making role. He completed 18 out of 20 passes more than any other City player within Dzeko’s entry to the end of the match. Finally in the 15 minutes following Dzeko’s entry Man city attempted 140 passes and completed 120 whilst their opposition West Ham couldn’t complete more than a 1/3 of their passes. They attempted 63 and completed 39; which was a complete U turn from their prosperous period earlier in the second half where they completed 72/88 passes. West ham pushed for the leveler leaving space and to no avail. They sit rock bottom of the premier league. Credit must be given for the improved performance, but as the commentator said you can’t just start playing after going 2 goals down.